Give your security specialists, investigators, computer incident-response teams, and litigation specialists everything they need to immediately and thoroughly search, collect, preserve, and analyze data from servers and workstations anywhere on your corporate network—without disrupting operations. 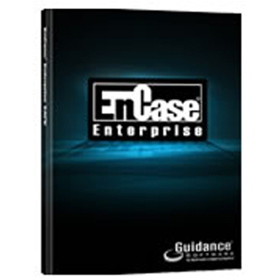 Be confident in your findings using EnCase® Enterprise, the trusted and industry-leading digital forensics solution used by more than 60% of the Fortune 100 and by numerous government agencies. •	Acquire from Almost Anywhere Acquire data from disk or RAM, documents, images, e-mail, webmail, Internet artifacts, Web history and cache, HTML page reconstruction, chat sessions, compressed files, backup files, encrypted files, RAIDs, workstations, servers, and with Version 7: smartphones and tablets. •	Complete Endpoint Visibility View hundreds of file formats in native form, built-in Registry viewer, process and system information viewer, integrated photo viewer, see results on a timeline/calendar. •	Forensically Sound Acquisition EnCase Enterprise produces an exact binary duplicate of the digital evidence, then verifies it by generating MD5 hash values for related image files and assigning CRC values to the data. These checks and balances reveal when evidence has been tampered with or altered, helping to keep all digital evidence forensically sound for use in court proceedings or internal investigations. •	Advanced Analysis Recover files and partitions, detect deleted files and password protected files, perform file signature analysis, and hash analysis, even within compounded files or unallocated disk space. •	Improved Productivity Examiners can preview results while data is being acquired. Once the image files are created, examiners can search and analyze multiple drives or media simultaneously. Enhanced caching capabilities have been designed to give you instant access to case data even if the machine is offline. • Automated de-NISTing Capabilities The National Software Reference Library (NSRL) is provided in the EnCase hash library format, allowing user to easily de-NIST their evidence, eliminating thousands of known files from their evidence set. This reduces the time and amount of data that needs to be analyzed significantly. •	Customizable and Extensible with EnScript EnCase Enterprise features extensibility via EnScript® programming capabilities. EnScript® allows users create to custom scripts to help them automate time-consuming investigative tasks, such as searching and analyzing specific document types or other labor-intensive processes and procedures. This power can be harnessed by you to greatly improve efficiencies around tasks unique to your organization. •	Automatic Reports Export reports with lists of relevant system information, files, and folders along with detailed list of URLs, with dates and time of visits. Provide hard drive information and details related to the acquisition, drive geometry, folder structure, etc.